Great teaching isn’t about knowledge transfer from the expert to the learner, it’s about clearing a path of discovery, and expertly guiding people down it. Since July of 2016, I’ve been formulating strategies for, and doing research on, how we can introduce the tenets and practices of product UX into the educational environment. I wrote in my journal quite a bit, gathering my thoughts based on the experiments that we’ve run to date, and reviewing the data we’ve collected from student. At the time, I came up with a term Educational Experience (EX). I did some research online to see if anyone else was thinking about this, and I came up empty. I was becoming a bit frustrated because I was sure other people must be thinking about it. It is very important to me as I believe it will be valuable in continuing to differentiate NSS and a thought leader on adult software education. Through serendipity, I discovered an article on EdSurge titled “UX to LX: The Rise of Learner Experience Design”. Looks like my Google Fu still needs work, as I should have discovered it months prior. For me, designing a learning experience is about creating an environment that removes the obstacles which can prevent a learner from achieving the defined learning outcomes. One reason I’m attracted to this term is that I’ve always considered true learning is experience. Information is just noise. My job is to help people filter, and use, the information effectively to begin learning. Learning happens through experience. The rest is just information. I’m looking at it from a holistic viewpoint - the entire experience of the student with the organization, its people, and content. It involves developing relevant, easy to consume content - both in the classroom environment and out of it. It involves knowledge of andragogy to effectively craft a course for the adult learner. It involves having the insight for how learners interact socially with each other and their coaches/instructors. It involves the integration of the practices and tenets of User Experience that, until now, has been focus on product design. At the intersection of those concepts is a great Learner Experience. Over the last two years, I’ve recorded about 12 videos covering a variety of concepts that we teach in class. They aren’t meant for public consumption to get from 0 to competent in those concepts, but rather an augmentation of their in-class experience. Something for them to watch over and over again while they reflect on their learning. Every single cohort of students provides feedback on how much the videos helped them during their time here. Unfortunately, the time I can dedicate to producing videos is constrained by many other demands, so I don’t produce them very often. Given that students receive them so positively, I’m looking at how we can provide more virtual learning resources for them outside of class. More videos is the lowest hanging fruit that we can provide and I will continue to produce them when I have time. I’m starting to collect data from current students and alumni about what tools they use to learn when they aren’t working (alumni), or in the classroom (students). Our delivery of content while at school is where we have iterated most. I believe that we are getting close to delivering the most innovative, community-aligned, and effective experience for learning in that environment. It’s only one part of the LxD but, likely, the most important since the student/instructor relationship is the most important one during the course. I want to be the best instructor, mentor and coach I can be. I felt that, in order to achieve this, I needed to hit the books and discover how the human brain actually learns something. I’m not talking about the ability to regurgitate information in short-term memory on a test. My goal is true comprehension of the fundamentals. What I discovered opened my eyes to theories, techniques, and studies that took my understanding of the human brain to an entirely new level. The brain doesn’t work the way you think it does. The traditional education system that we all grew up experiencing certainly doesn’t seem to apply much of the the conclusions of the research in learning and cognitive development. Software is a team sport. The antiquated idea of the solitary hero is completely gone. There must be strategically placed time slots for each student to complete small tasks individually. This allows the students to have quick successes - which enhances their experience - but also allows instructors the time for individual mentorship and guidance. However, from the data that I’ve collected so far, it is clear that the group projects are where the vast majority of learning takes place. Right now, individual time accounts for, roughly, 30% of a student’s time while at school. The other 70% includes in-class lecture, team live-coding, and group projects. These are all scenarios that are highly interactive and build on their social development skills as developers. This is a ratio that has been tuned over the course of all cohorts that I’ve taught since January of 2015. If I force them into too much group activity, then they lose the ability to determine their own level of comprehension. This causes stress and uncertainty as they near their completion of the course and are planning for their career search. At the other extreme, if there is too much individual work, then comprehension plummets because they encounter obstacles more often, and are less likely to approach their teammates, or the instruction staff, to obtain help in overcoming them. Being in a group lowers that hesitance, or friction, and allows them to progress at a more consistent pace. Learning to become a software developer is ambiguous, uncomfortable, and remarkably difficult. There is never a "right way" to do things, which is unsettling for many adults. Here’s the basic premises of andragogy - how adults learn. Adults cannot be made to learn. I learned this early on. They are here by choice, not compulsion, so trying to enforce a learning schedule on them is pointless. I have to inspire them want to learn. Adults learn by doing, not by passive listening, because they are much more self-directed than children. Actively participating in the learning process is critical. Adult learning is affected by the different experiences that each adult brings to the group. Adults need to solve problems instead of being force-fed knowledge. Adults are less open-minded with age, and resistant to change. If they are going to be motivated to learn something, they need to know why. For complex problems, there could be hundreds of possible combinations of code that have no measurable performance benefit over the other, and adults often struggle with that ambiguity. Yes, I could show them how I would write the code, but leads to students thinking it is the correct way, thus stifling their creativity and problem solving skills. I’m still a neophyte when it comes to product UX, and will likely gain knowledge in trickles because I’m applying all things that I learn to the domain of instruction and learning. The three main takeaways I use from the field of product UX are as follows. I don’t enjoy software development because I love coding. I enjoy it because I love to learn. 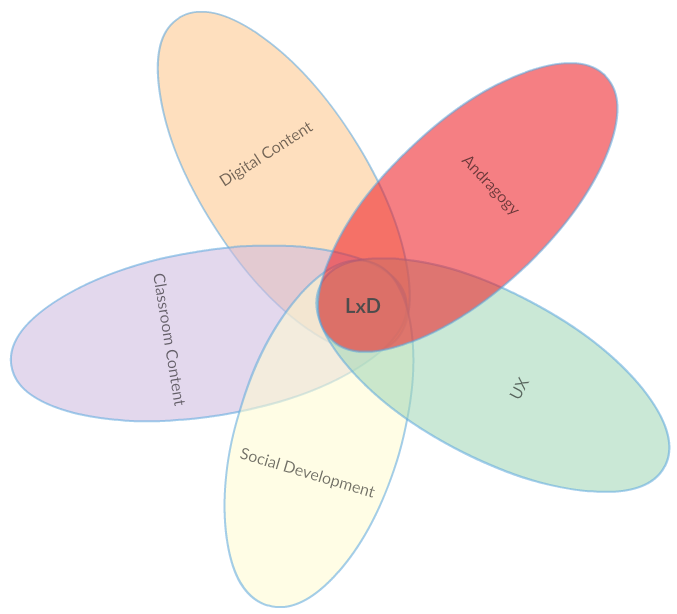 Changing how I teach, and considering all these aspects of LxD, did not happen overnight. I had to pick the low hanging fruit first, and then collect data. Once the data started to roll in, and we talked about our observations with each other, that’s when the real work began of building a great experience for our students. Since accelerated bootcamps are a new market, it was impossible to find information on what works best in the environment, so I had to research the foundations of adult learning and then apply those principles and see what emerged. It’s been fascinating to see how the course has evolved over time, and I do believe I am vastly better at instructing, and coaching than I was two years ago because of this process.